Hydrophilic interaction liquid chromatography (HILIC), especially in conjunction with mass spectrometry (MS), has become a powerful tool for the analysis of a wide variety of challenging analytes. Applications of the technique have increased dramatically over the past decade, especially for the analysis of polar analytes where reversed-phase chromatography suffers. HILIC conditions employ a high percentage of acetonitrile which enables facilitated solvent evaporation in LC/MS sources and thus often an increase in analyte response when compared to more aqueous based systems. The increased retention of polar analytes afforded by HILIC provides improved selectivity and decreases the impact of endogenous species, often leading to improved qualitative and quantitative analyses. Although HILIC has proven useful, it has also been thwarted with complications including difficulties in method development and method robustness. 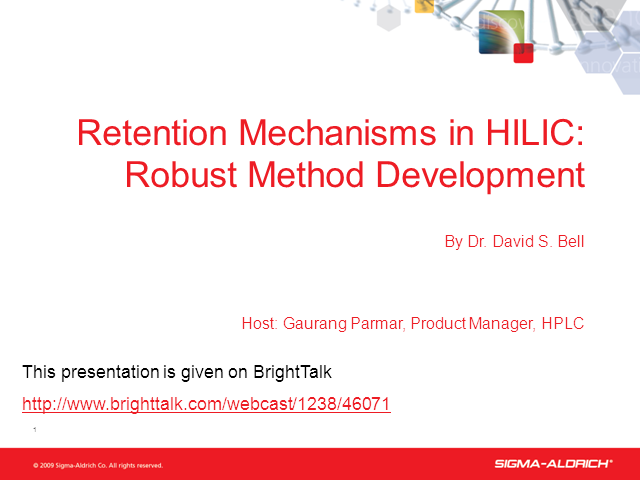 In this presentation, studies investigating the underlying retention mechanisms dominant in HILIC chromatography are presented and discussed. Along with reversed-partitioning HILIC is well known to exhibit, ion-exchange and the interplay of the dominant mechanisms are unveiled and used to develop a model of overall retention and selectivity. Interactions that operate using different stationary phase chemistries and conditions are presented. The impact of analyte polarity and charge as well as the variations caused by high percentages of organic on these physiochemical parameters are highlighted. Throughout the discussion, examples of use and misuse of HILIC are employed to illustrate these important concepts to build a solid fundamental foundation for efficient and effective use of this powerful technique. Presented by: David S. Bell, Ph.D.